The amount of change our ancestors would have experienced & witnessed over their lives in the twentieth century was incredible. 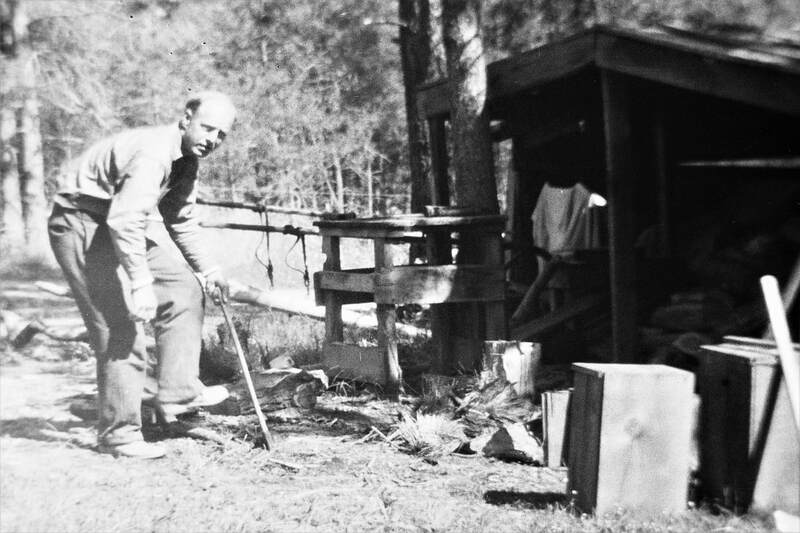 From establishing a primitive homestead, to the current conveniences of a modern day home; from cooking over an open fire or one contained in a woodstove, to a microwave, to harnessing alternative energies; transportation by horse and buggy, then automobile, train, airplane, to electric self driving vehicles; introduction of the telephone, radio, television, to the computer, smart phones, the internet, voice recognition, and artificial intelligence. I am not sure that any future 100 year period will experience the same dramatic changes. 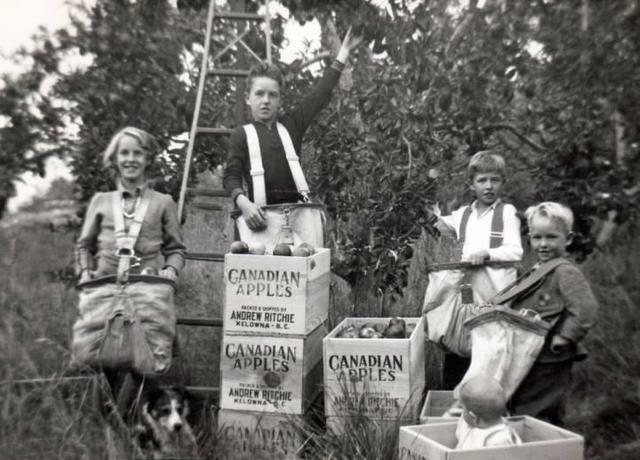 This is our family's story as true Canadian pioneers in the Okanagan Valley of British Columbia. 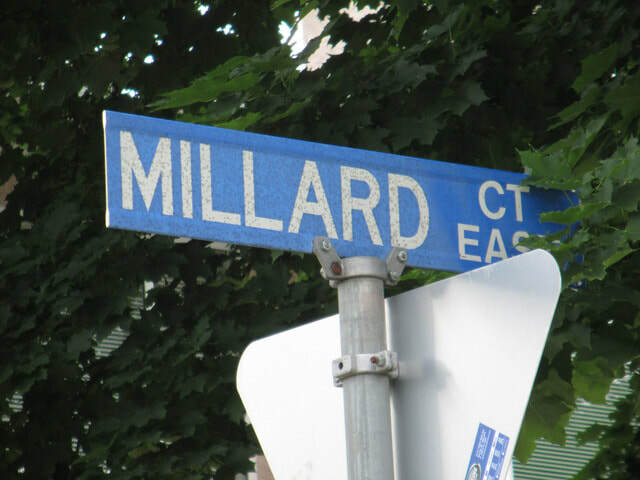 Born in Montreal, Quebec on July 30, 1885 to parents Henry Richard Millard and Susan Mary Watts, Percy was the second youngest of Henry's 15 children. Percy would have been 17 years old in this photo below with his mother Susan Watts Millard and 6 siblings, and stepsisters Jemima and Eleanor Louise taken in 1903. Brother Frederick Herbert, and step brothers Samuel, Josiah, Henry, Henry Thompson, and an unnamed child had already passed away. 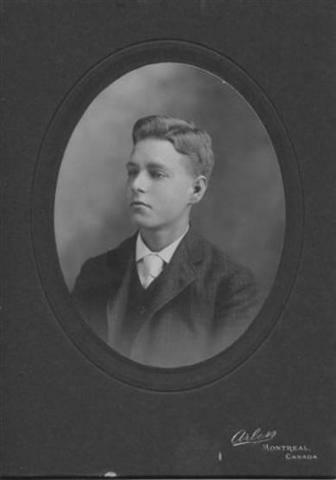 This is the earliest photo I have been able to locate of Percival Richard Millard at age 17. Seven children were born to Henry and Eleanor in Montreal step brothers and sisters to Percival. 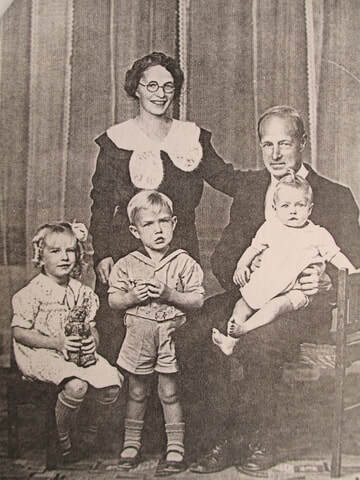 Samuel, Henry Thompson, Jemina, Eleanor Louisa, Josiah, Henry, and an unnamed child. Eleanor died following the birth of Henry in 1872. 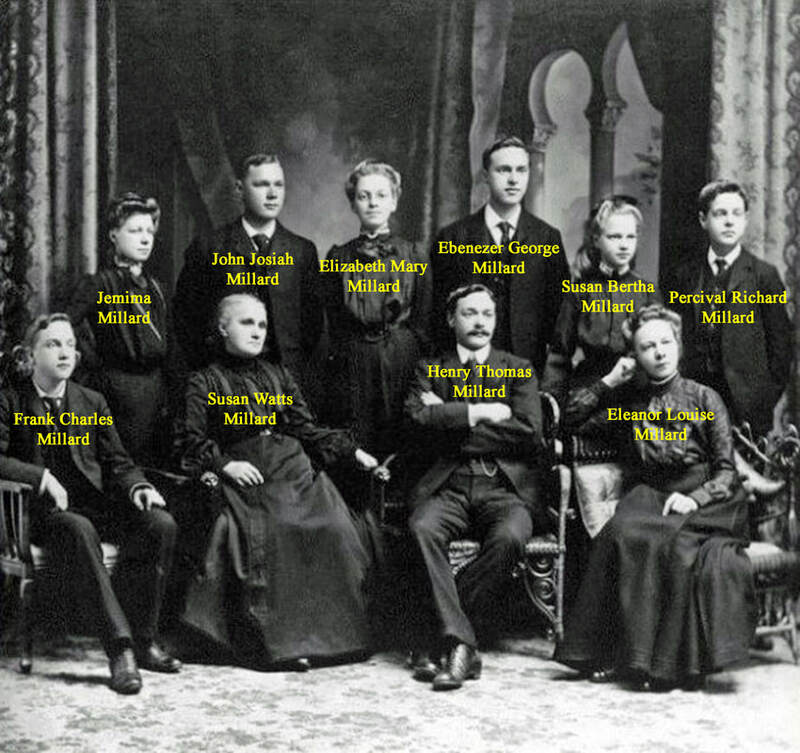 A year later, Henry married Susan Mary Watts in Montreal, and they had eight children between 1873 and 1890, with Percival Richard, born in 1885, being the second youngest. John Josiah, Henry Thomas, Elizabeth Mary, Ebenezer George, Frederick Herbert, Frank Charles, and Susan Bertha were his siblings. While 5 of Percy's 15 siblings died in infancy, it is interesting that only 4 other siblings had offspring. As a young lad he spent his early years as an errand boy for his father's watch repair business. 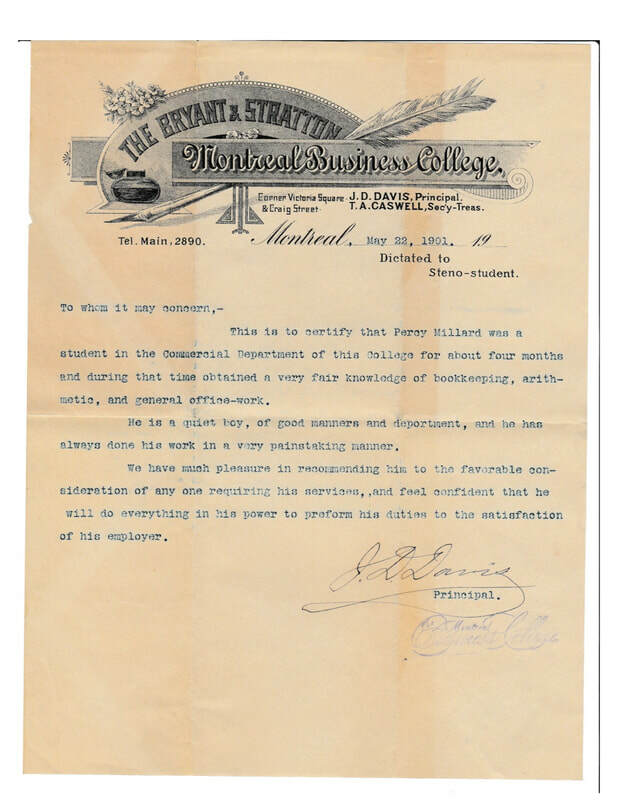 In 1901, at the age of 16, he went to Bryant and Stratton Montreal Business College for four months. 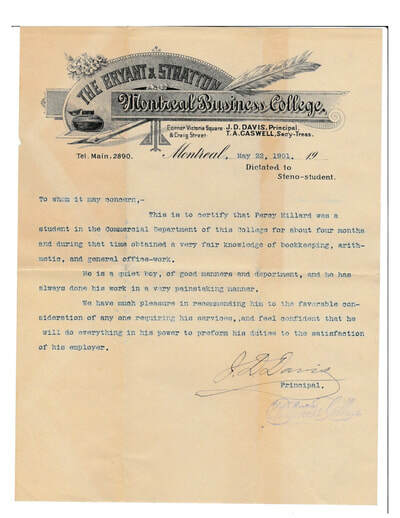 On May 22, 1901 he obtained a certificate for completing four months of bookkeeping and office work education at the Montreal Business College. 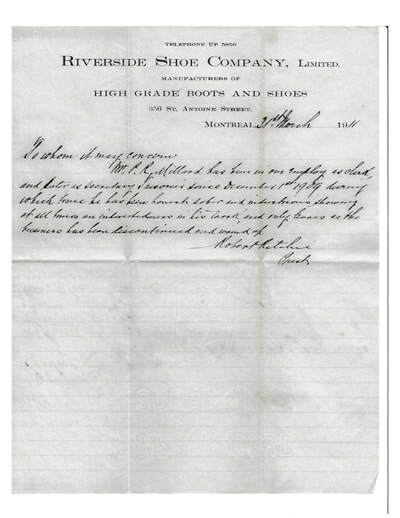 The letter shown states he received a very fair knowledge of bookkeeping, arithmetic, and general office work. 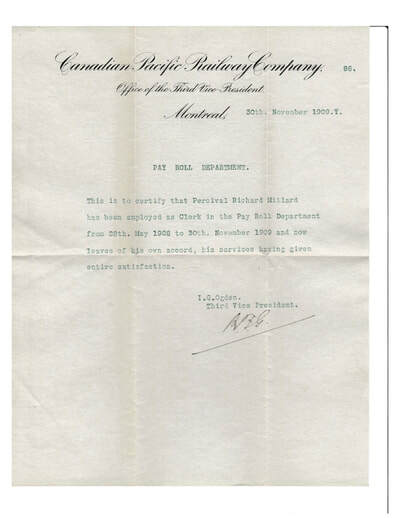 He worked in the Payroll department of CP Railway from May 28, 1908 to November 30 1909. He then left to become the Secretary / Treasurer for the Riverside Shoe Company from December 1, 1909 to its closing in March 31, 1911. He was a smart, well mannered, industrious gentleman who was very quiet but well respected. Often singing while working, he enjoyed the outdoors, animals, gardening, fishing, boating, and camping. In a 1911 census it shows that Percy was living on his brother John Josiah's farm in Caldwell Township, Nipissing District, Ontario. 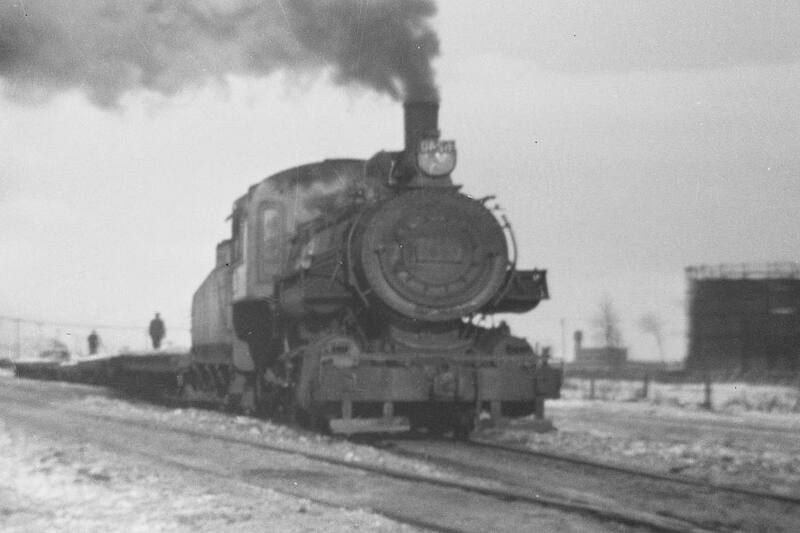 Several decades later his brother John would come out west to live with Percy for a while. 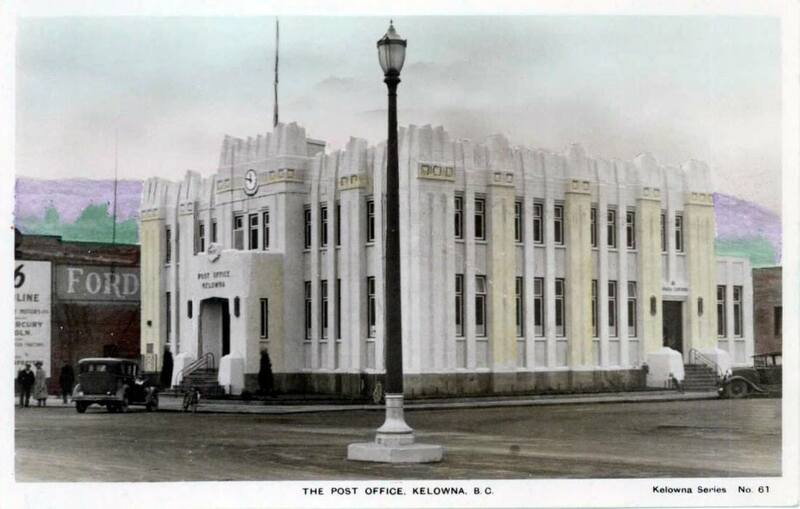 In 1912 Percy moved west to Kelowna, in the beautiful Okanagan Valley in British Columbia, Canada. 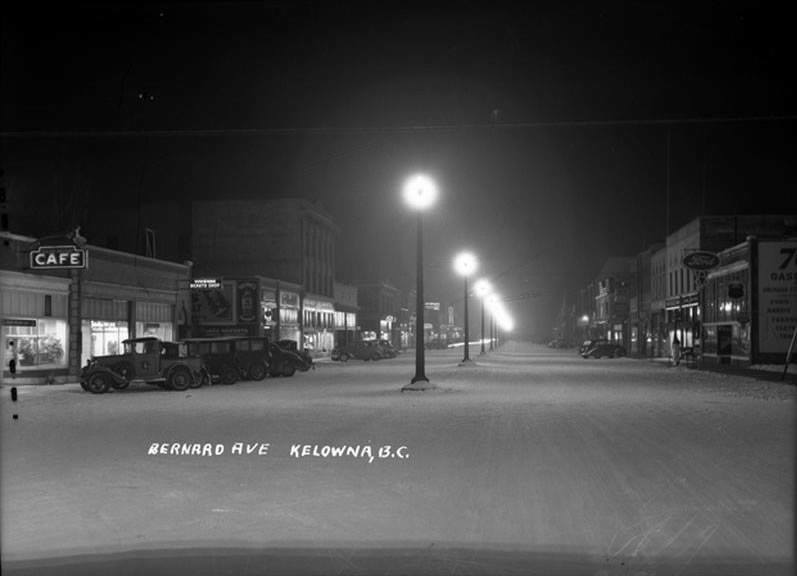 The 1911 census shows the entire population of Kelowna to be 1,123 people. 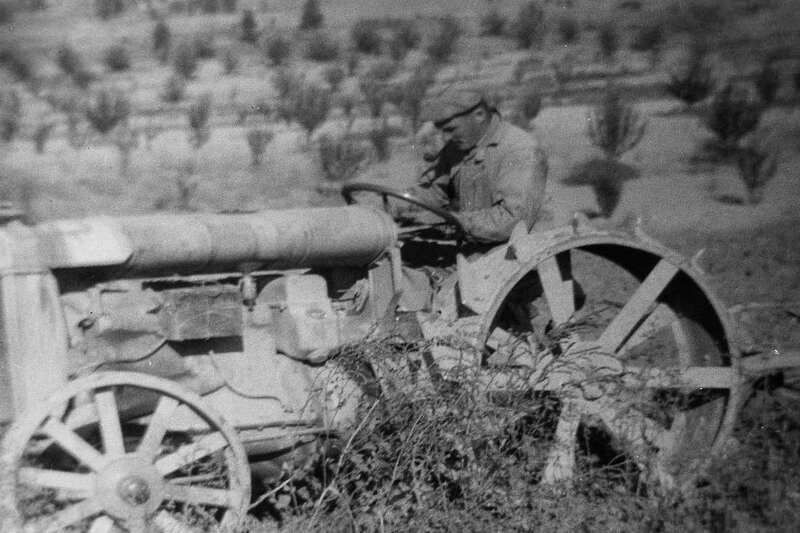 He worked for the Glenmore Irrigation District on road maintenance, and planting orchards. 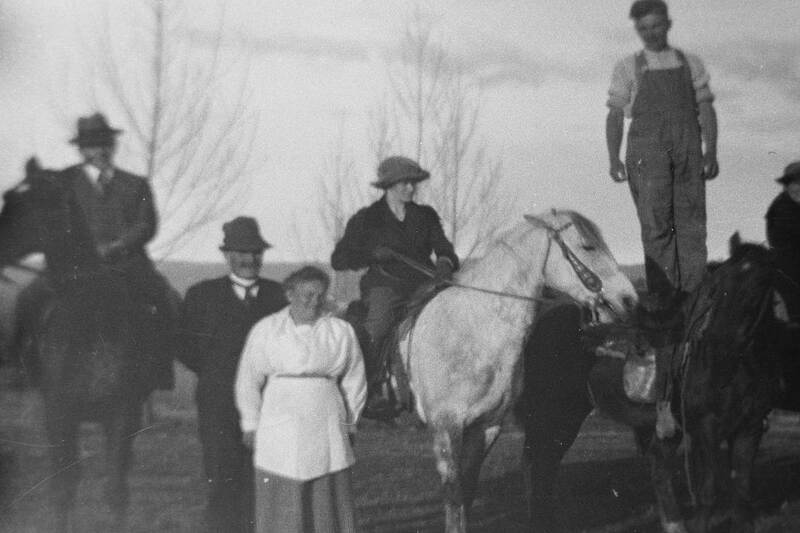 With an average annual rainfall of only 12 inches Glenmore homesteaders used their land for cattle ranching, logging and subsistence farming. 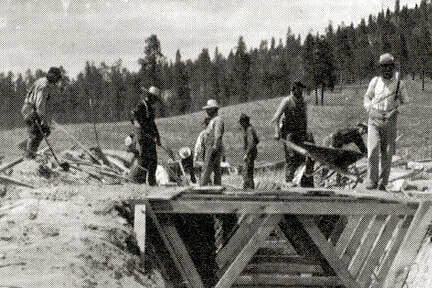 Irrigation in the great valley of Glenmore required storage, and flumes to transfer the water long distances. The Postill Lake Reservoir was designed to supply 5,000 acres with water. 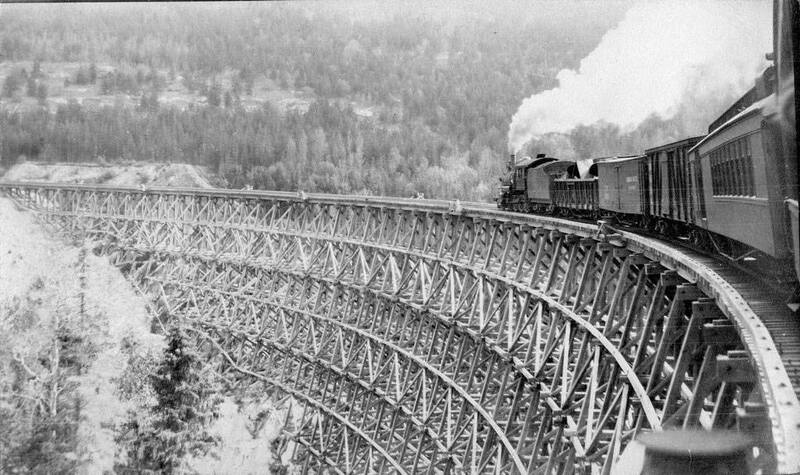 Nearly 29,000 feet of wooden, and steel flumes were built, often suspended on trestles, by Central Okanagan Lands, and subsequently Glenmore Irrigation District to distribute water to area farms. At this time irrigation was transforming the landscape and economy from cattle ranching, and grain fields, into fruit orchards, and irrigated orchard lots were selling for $ 350 per acre. 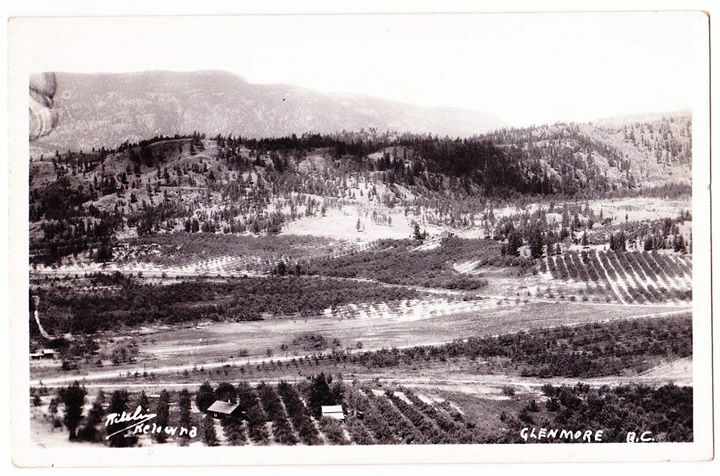 In 1912, Stewart Nursery planted 100,000 fruit trees, establishing Kelowna as an agricultural region. 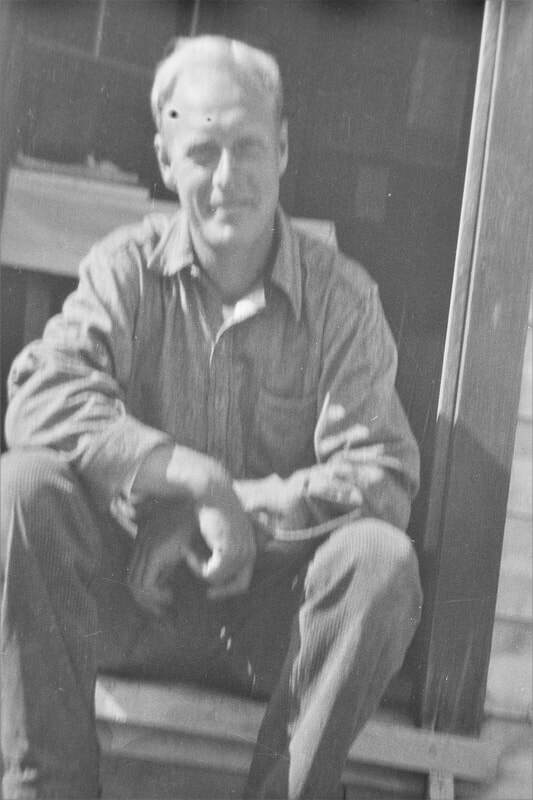 Percy was a pioneer in the Okanagan playing a role in helping transform this area into Canada's major fruit growing region. Theodosia Margaret Groth ( Percy's wife ) was a twin, with eight brothers and sisters. 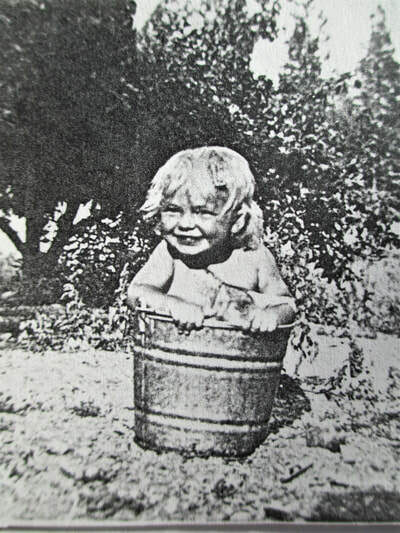 Along with her twin brother, Theodosius Maxwell Groth, they were born February 26, 1908. Her twin brother died in 1916, and is buried at Mount View Cemetery, Vancouver, BC. 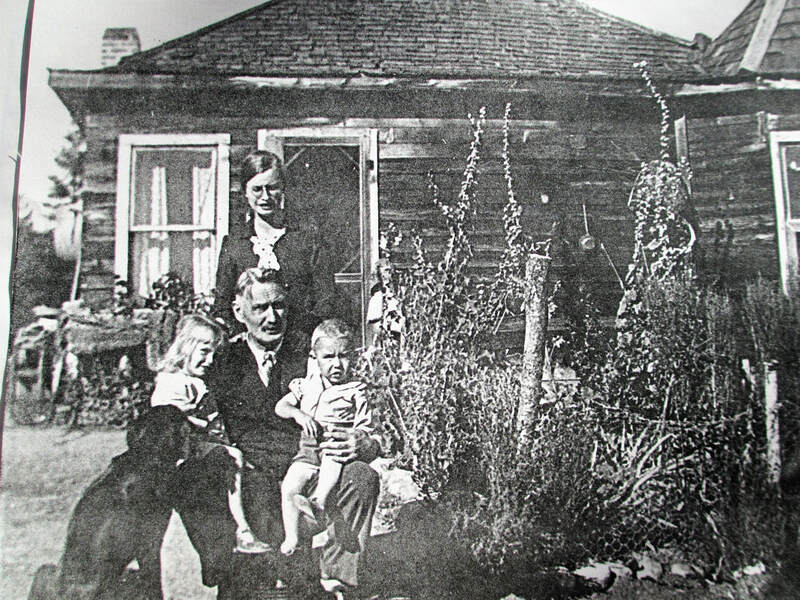 In the early 1900’s Theodosia's Groth family lived in a small house in the woods in the area of 15th and Dunbar, Vancouver, B.C. Theodosia ( Docie ) recalled when she was about four years old a huge wind storm felled a large tree on their house. It damaged the roof and entered the house. The children huddled with their mother in the kitchen. 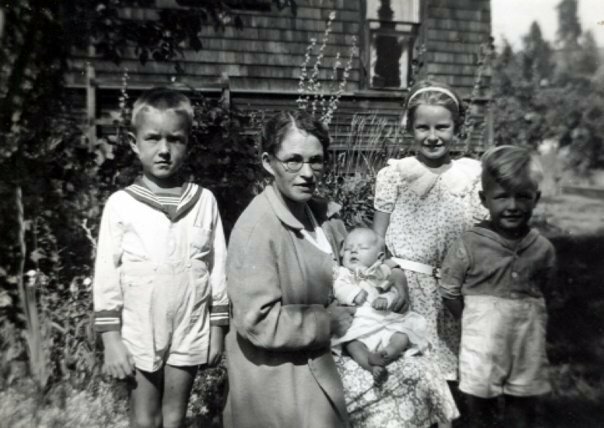 Her days as a child were filled with swinging on the maple trees, walking & picnicking in Stanley Park and winter sleigh rides on Hybueny Hill. She attended Bayview school and helped in the large family garden, and raising rabbits. From an early age she attended Sunday Plymouth Brethern meetings in Kitsalino. Her Father worked in the maintenance yard for Canadian Pacific Railway and her mother was a seamstress for the family and others. 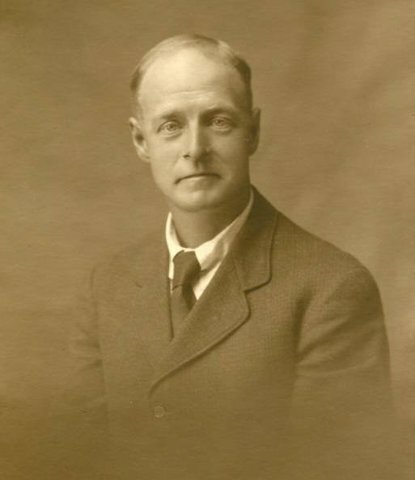 Docie's maternal great-grandfather, Daniel Coe, a licensed hawker, born in 1808 in Wickhambrook, Suffolk. Her maternal great-grandmother, Sarah Cross, born in 1817 in Ely. Ely is a market town in Cambridgeshire, England on a small island renown for the eels fished there and from which the town's name is derived. The marshland surrounding it was drained in the 17th century. Ely's Cathedral is an tourist attraction and its foundation was laid by the first Norman abbot of Ely in 1081-1094. Sarah Cross' mother, Marry Palmer, is shown to be from Prickwillow, Cambridgeshire. In 1909, George's family moved from their residence on Howe St. along with his father, William, to Mayne Ave (Willingdon Ave) in Burnaby, BC. They were family friends of J. Murchies of the Orient Tea Company with whom they had weekly Bible studies. During the war years 1914-1918, dolls were rare and William and George operated a 'doll hospital' on Hastings St. William and Emma Coe's daughters, Sarah, Clara and Lydia started a hairdressing business at 537 Howe St. George established a china business on Cordova St, then in 1918 they relocated to 420 W. Hastings opening as the 'Miller and Coe' toys and china shop. 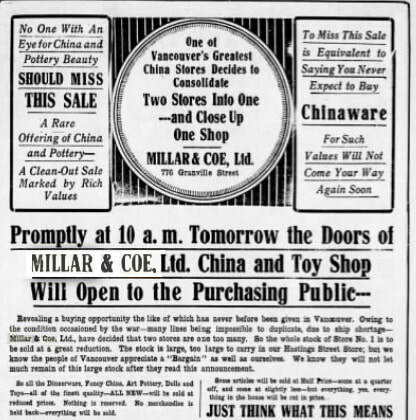 The building, owned by E A Morris, renovated it's facade for the consolidated store, now selling china and glass, restaurant quality pottery, and toys. 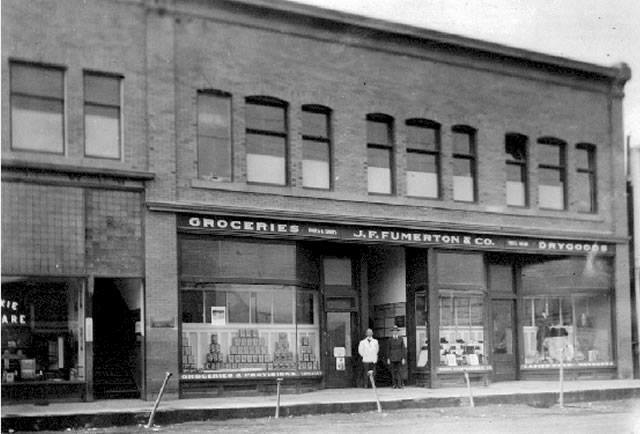 In the early 1920s, he sold the store to R. Miller. 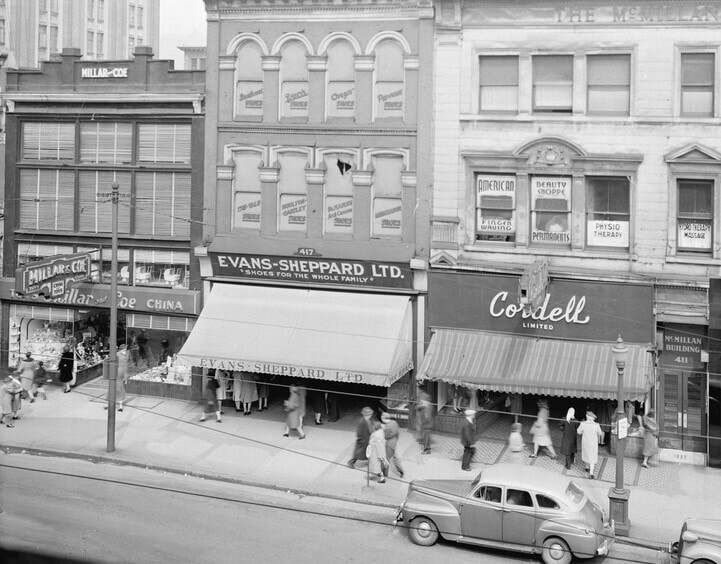 Then, George had a series of jobs, working with his sons, Cecil and Clifford, at their business 'Coe Bros Wood and Coal', managing the 'Share Bros Bargain Basement' on Hastings St., operating a confectionery store at Alma and 4th Avenue, working at the Maine and Hastings St. confectionery, and establishing another 'doll hospital' in 1925. 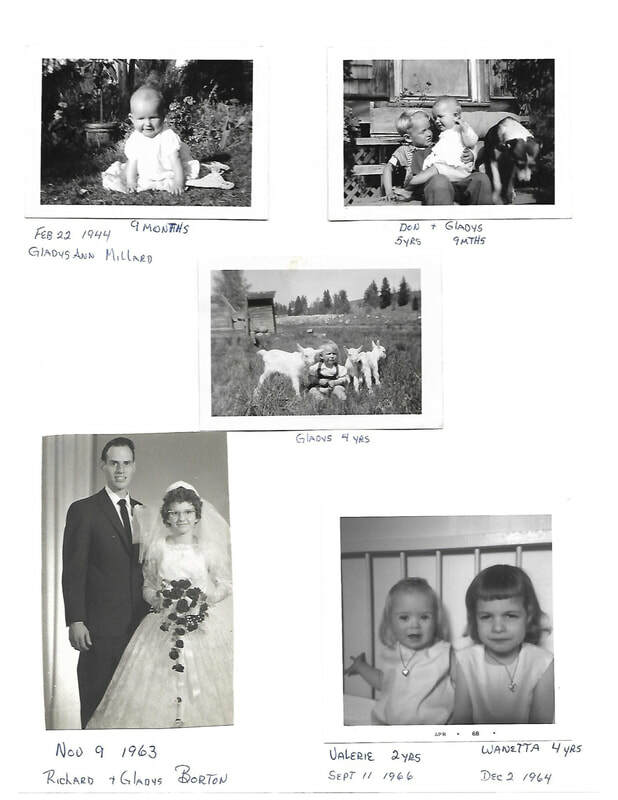 Docie recalled a time when her father took her fishing on English Bay in a small rowboat. A storm came up, they struggled with the swelling waves and winds and barely made it back to shore. Or the occasion when she stepped out on the back porch to throw out the dirty dishwater and managed to soak the poor Milk Man. 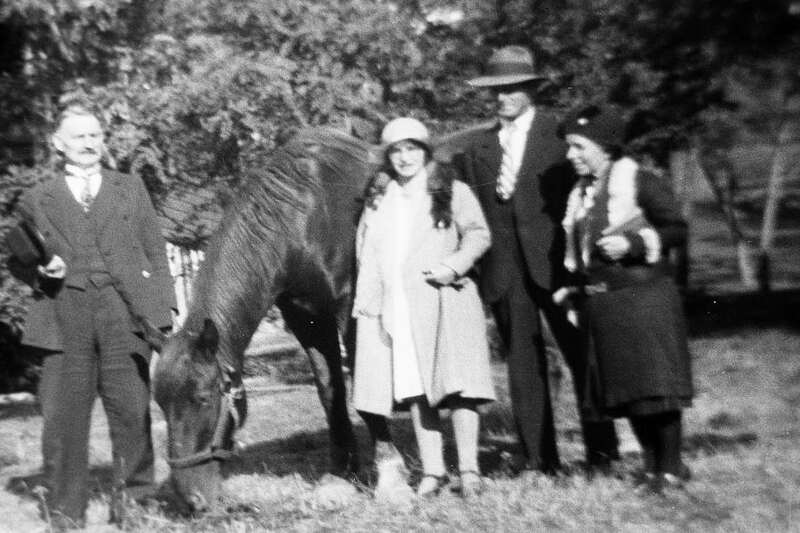 In 1929, the start of the great depression, Percy bought 1 1/2 sections ( 960 acres - 1.5 sq miles ) and established a homestead in the district of Yale, overlooking the Glenmore Valley. He built a house on the property. The fresh crisp air in spring and fall, or the dry scent of arid pine on long summer days, would have been conducive to a " simple wholesome lifestyle " - no electricity, or running water. Long days filled with hard work of chopping wood for cooking and heat, clearing and working the land for planting, and irrigating. I have spent many hours hiking, cycling, and motorbiking in this semi-arid forest area where my grandfather was a pioneer. 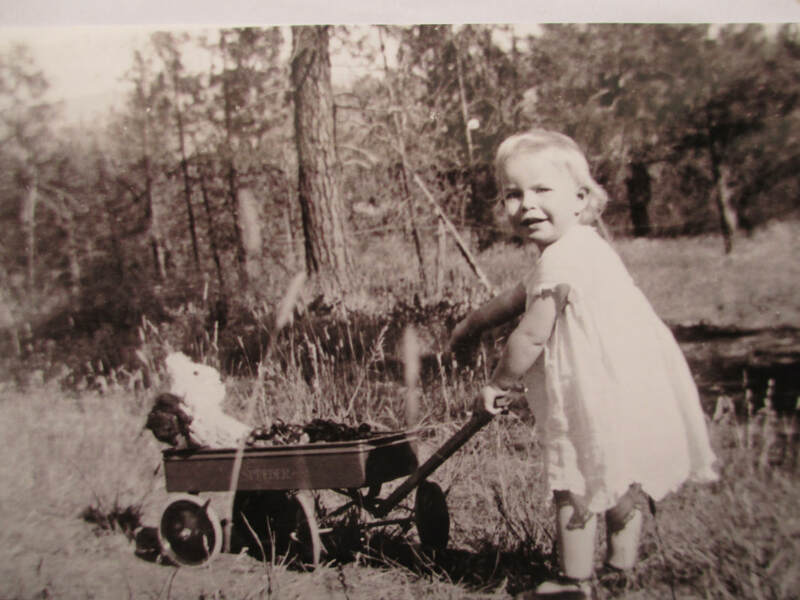 Along with my father, who was born on this property but moved as a toddler, we located the skeletal remains of the old homestead, and various fruit trees that had been planted and were now wild. Today, in the 21st century, this area has been subdivided and developed for literally thousands of high end homes. 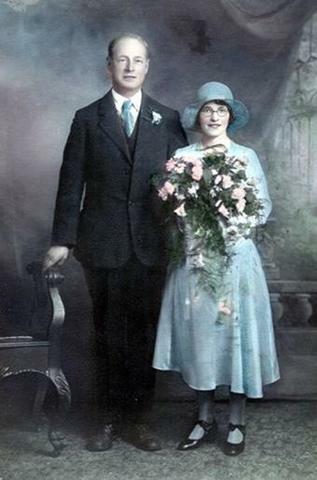 On February 25, 1931 he married Theodosia Groth of Vancouver, in Vancouver, B.C. They met through the Plymouth Brethren meetings. It is unclear how long they knew each other or how the courtship may have transpired. When Docie got married and moved to Kelowna, the rest of her family left Vancouver, and moved to California looking for better employment opportunities. There's gold in them thar hills ! In Percy and Docie Millard's North Glenmore remote orchard homestead, the couples’ first two children, Marguerite Susan on January 23, 1932 and Richard Ernest on July 18, 1933 were born. Pioneer life involved long days of hard work, clearing the land, harvesting hay with horse and wagon, and planting and maintaining vegetable gardens. Daycare was unheard of and as many of the photos show young children were looked after while busy working. 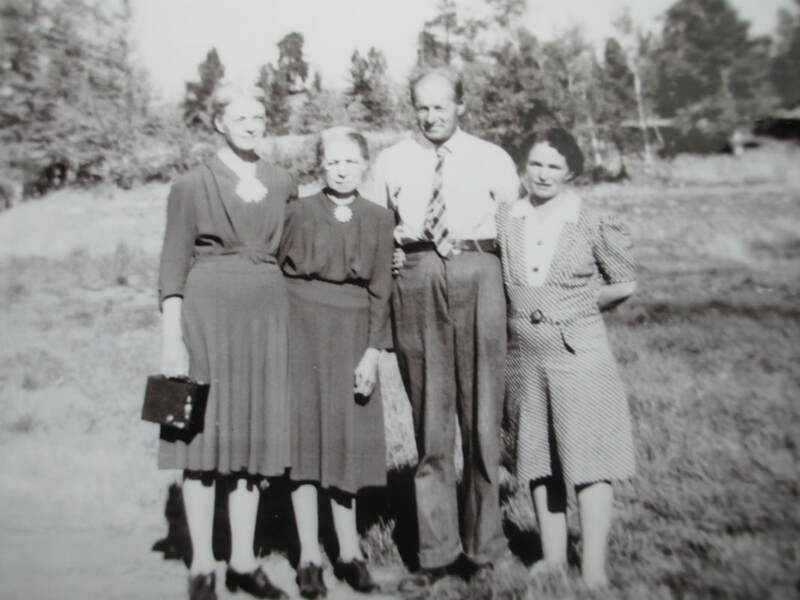 Their closest neighbors were Mrs. Gertie Kerr and Miss Lawrence about two miles away. They were good friends. 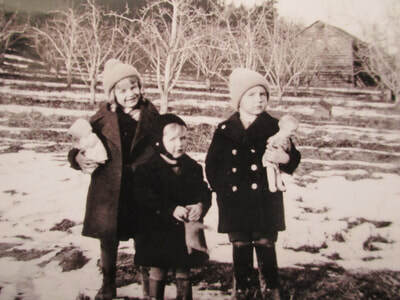 Their third child Arthur Frank was born on January 7th, 1936 at Kelowna General Hospital - his arrival home was an 8 mile winter horse drawn sleigh ride. As yet an uncomfirmed story, I was told that Percy lost the Glenmore property due to not having insurance or sufficient resources to cover the damages of a car accident. 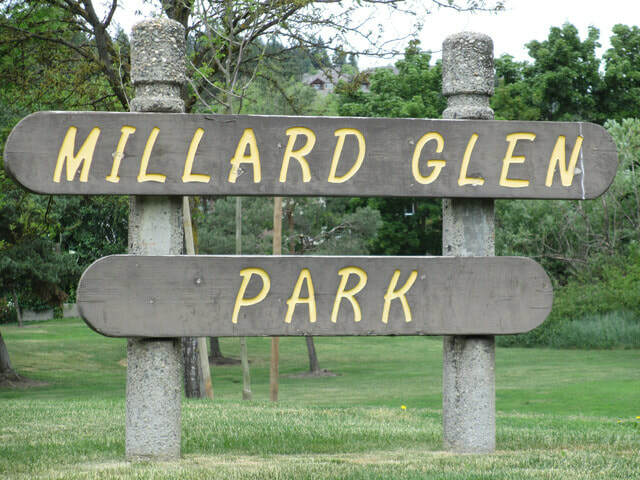 Currently there is a tribute memorium in the area with a park being named Millard Glen Park, and several of the lower subdivision streets are named after the family - Millard Place, & Millard Court East & West in their honor. 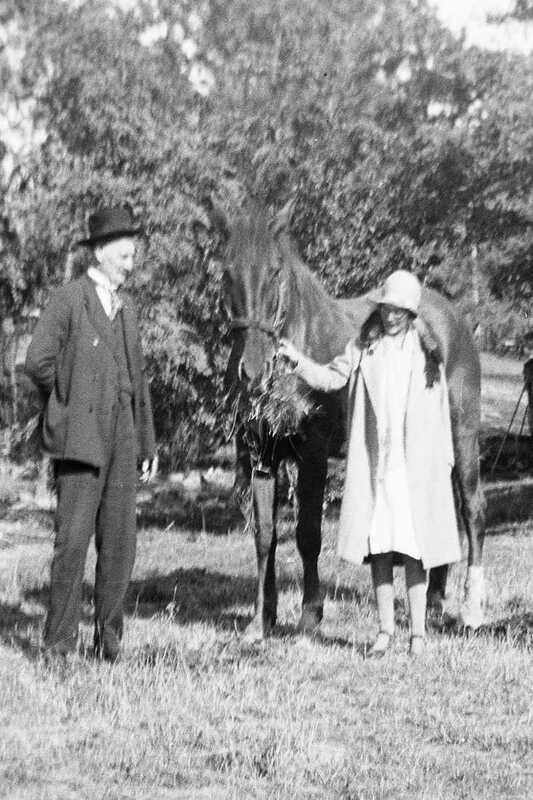 In 1937 Percy & Docie purchased a 22 acre farm / orchard in Rutland just off Hollywood Rd. There was 7 acres of fruit orchard, apples, pears, cherries, and crab apples and the remaining 15 acres of pasture and a very large vegetable garden with potatoes, carrots, beets, and parsnips. 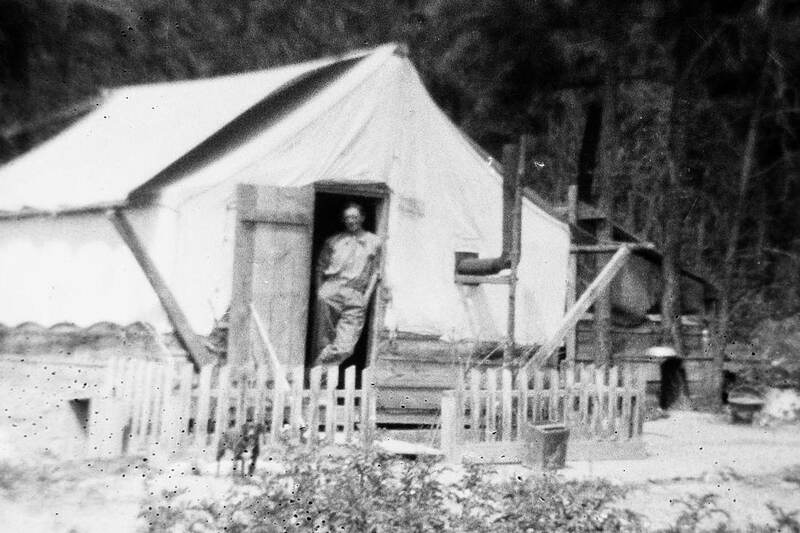 Both of these homes were without electricity, and indoor plumbing. Coal Oil lamps and outhouses were the order of the day. This new location would enable the children to attend school, as there was not a schoolhouse in the district of Yale. There is a direct correlation between land use and population. In a hunting and gathering economy each family requires more land than would be needed in an agricultural economy. Thus the early homesteads were significantly larger than agricultural orchards and lands. 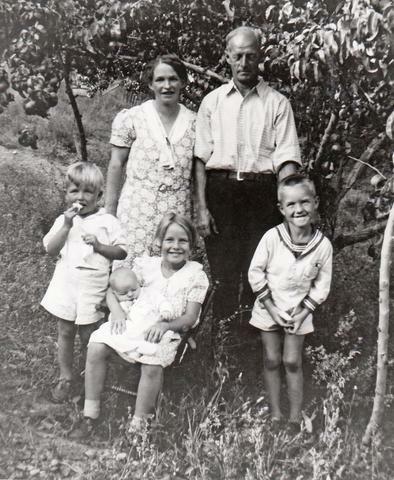 In the early 1940s the general belief was that a man and his family must have at least twenty acres of land to make a living growing apples or about ten acres for soft fruits like cherries, peaches, plums in the southern Okanagan. Behind the house was a well in the back yard where Docie used to wash clothes on a scrub board. 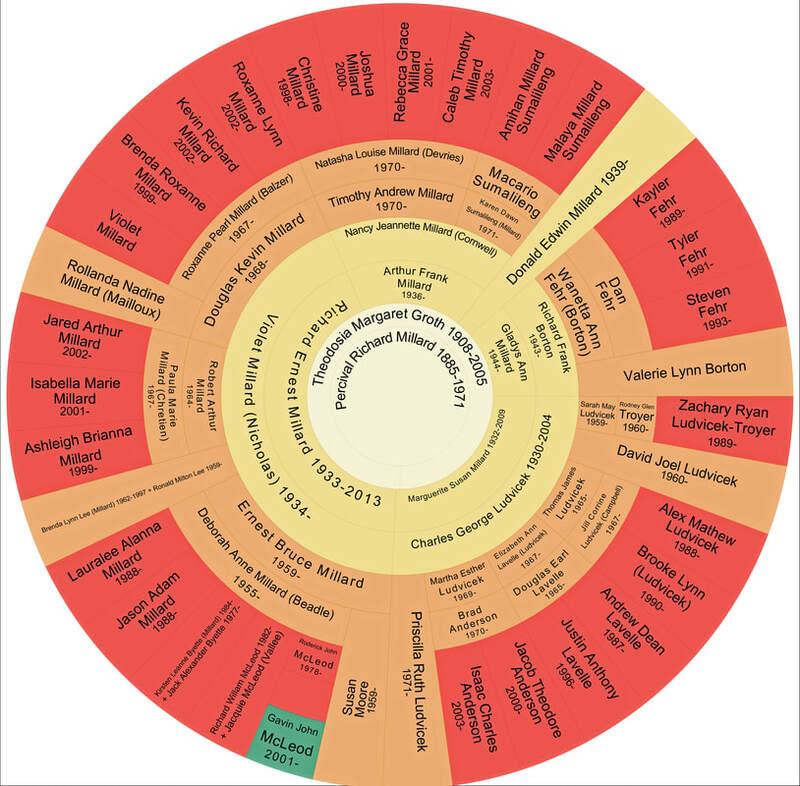 Cooking, baking, and home preserves of the bountiful Okanagan fruit were done using a wood burning stove. Meals were often generous, hospitality warm, and even with a large family the house was often full of company. Along with her husband, Docie was a very hard worker and she loved to entertain. 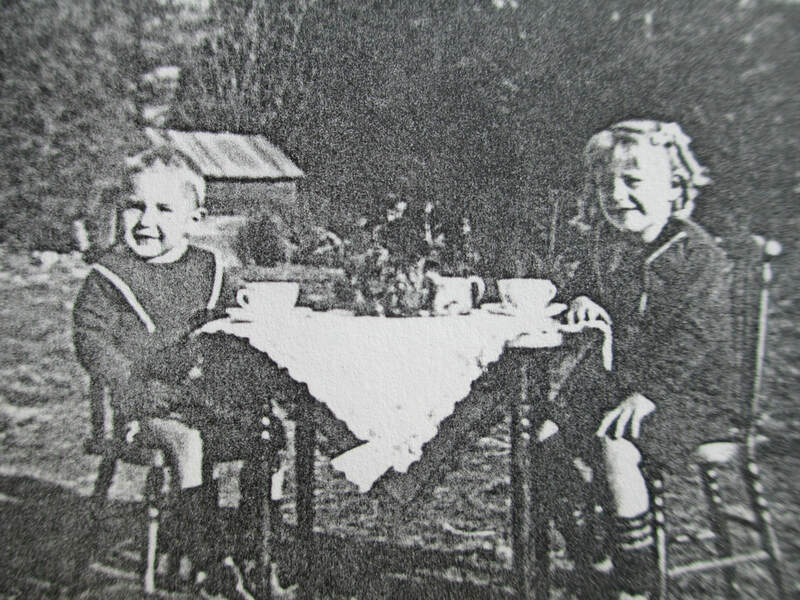 On August 11, 1939 they were blessed with their third son Donald Edwin. Percy's nephew Frank Millard, son of John Josiah visited the Percy Millard family in 1942 while on military leave. 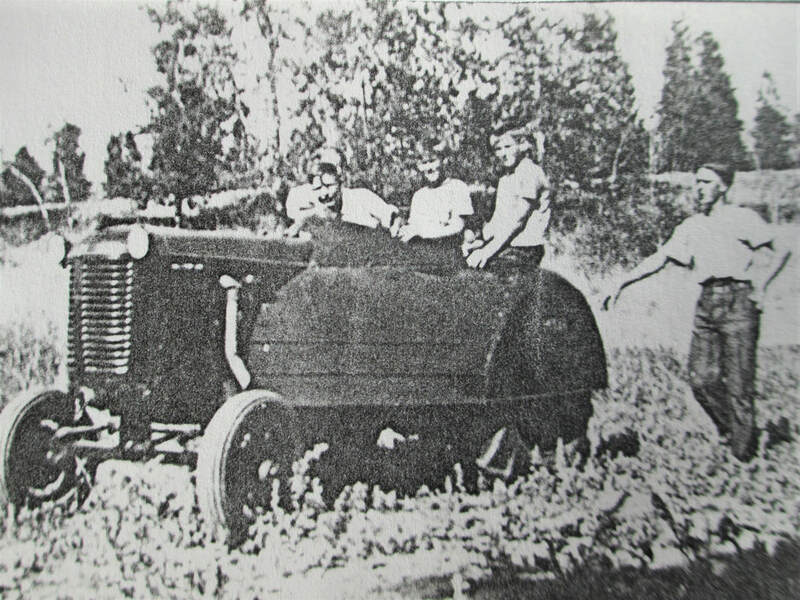 In the photo above he is standing beside Percy's 1936 Austin A-Seven. 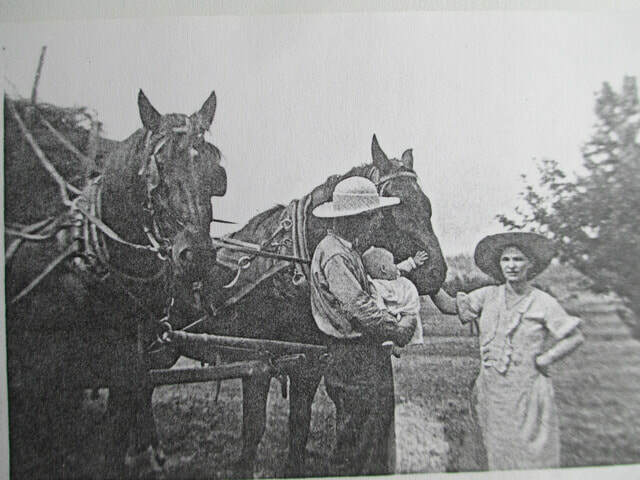 John Josiah, Percy's brother on whose Belleville farm back east he had lived with in 1911, came to live with Percy and his family in 1950. 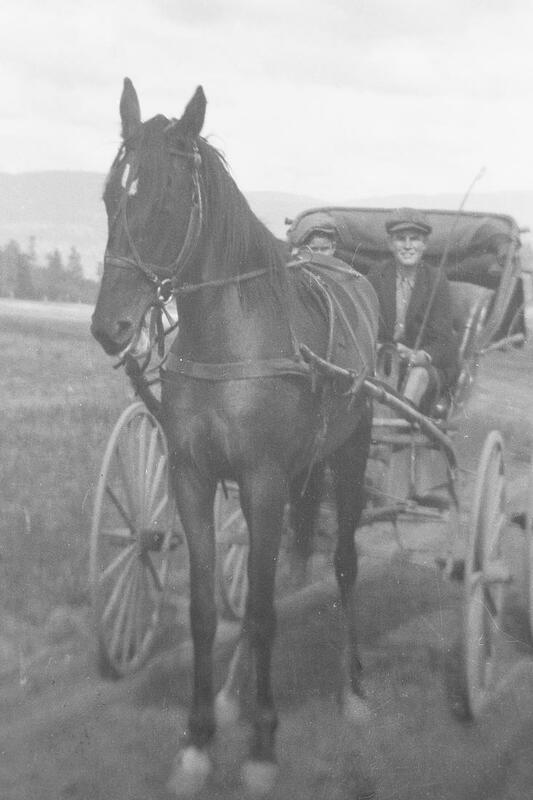 He had found himself more or less deserted by his sons as they matured, and after the dairy burned in the early 1940s (perhaps not by accident), he left the farm deserting his wife in the process, and traveled to Kelowna, B.C. where he lived with his brother. He then purchased a home in Benvoulin, and a car. 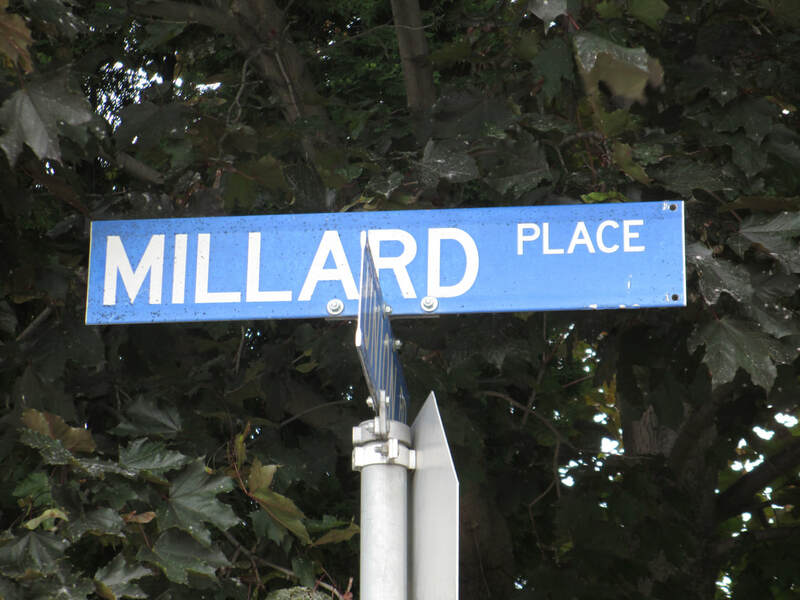 Several years later he had some health issues, sold his property, and returned to live shortly with Percival and his family, later returning to Belleville. The school the children attended was two miles from the house. They walked most days except on occasion when their father would drive them in the 1936 Austin Seven. In later years they had bicycles and rode to school. 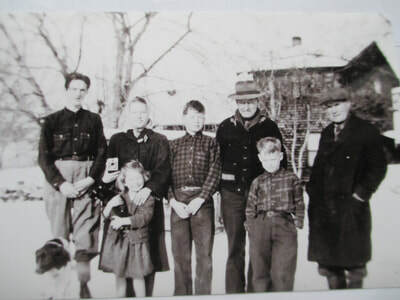 Their neighbour friends were Andrew Ritchie who had three children, Steve & Bertha Kornzie and their three children Herman, Larry, and Marline. 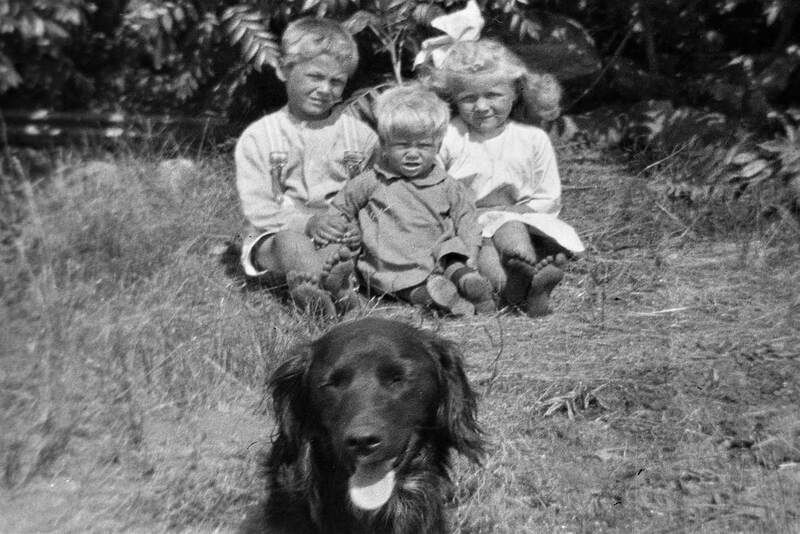 And the Ottenbrights children Raymond, Janice, and another girl. 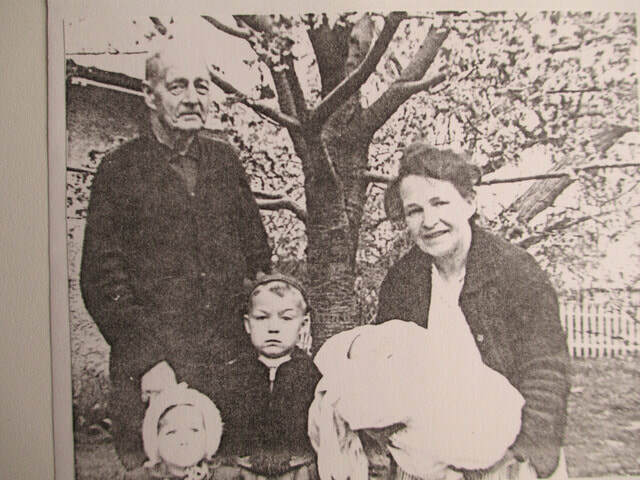 Life was very busy for the pioneer family, fruit tree farming was a tough business. Everyone worked very hard. Pruning, and chopping wood when enduring the cold harshness, and bitter freezes of winter. Spraying to avoid problems with insects, thinning apples, digging irrigation canals, and planting the garden in the spring. Nurturing seedling fruit trees for 4 to 6 years waiting for them to bear fruit. Warm, sunny summer days were spent caring and watering the large garden, and orchard trees. Late summers entailed many hours harvesting the bountiful cherry, pear, apple crops and vegetables. Then they faced challenges of low fruit prices, transportation and storage challenges. Winter evenings found the family gathered around the fire sharing & reading stories, playing games, making picture puzzles. It was a warm, loving, family environment centered around the Lord's teachings. Weather is always a concern for orchardists. Late spring frosts, cold rainy summers, strong winds, and freezing winters can all affect the quality of the fruit. Fortunately, the bank of clouds that generally hangs over the Okanagan Valley in the winter prevents the killing of fruit trees. The clouds tend to keep the valley warmer. However, even with the cloud cover, on average there is a killing frost every seven years in the Okanagan Valley. 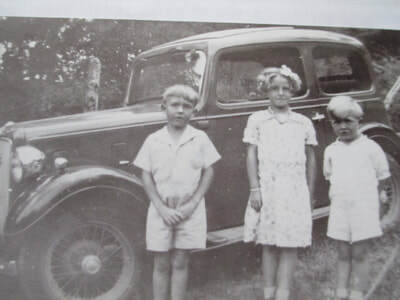 On February 22, 1944 Gladys Ann, their second daughter, was born. Several months old she was not yet able to help harvest apples in the orchard but she did keep an eye on the others from within the apple box. I doubt whether youngsters today will ever experience an apple picking bag or harvest. I have spent many weeks harvesting apples, pears, cherries, apricots, plums, and peaches in the Okanagan orchards. As a youngster moving the 18 ft heavy wooden tripod ladders, carefully picking the ripe fruit, scrambling up and down the ladder with full bags, or buckets was definitely a builder of character ! I certainly understand the strength and stamina of our ancestors. 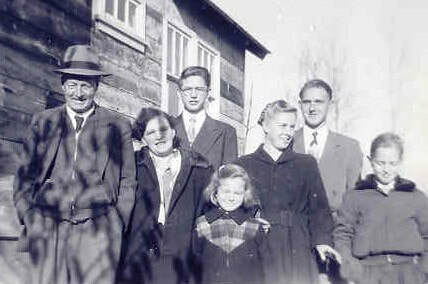 The family recalls " the days were great when we got electricity, an indoor toilet, and a bathtub, and when we got a tractor to work the land." In addition to the orchard and garden they had bantams, chickens, horses, pigs, and goats to care for and raise. Feeding, milking, and cleaning were daily tasks. 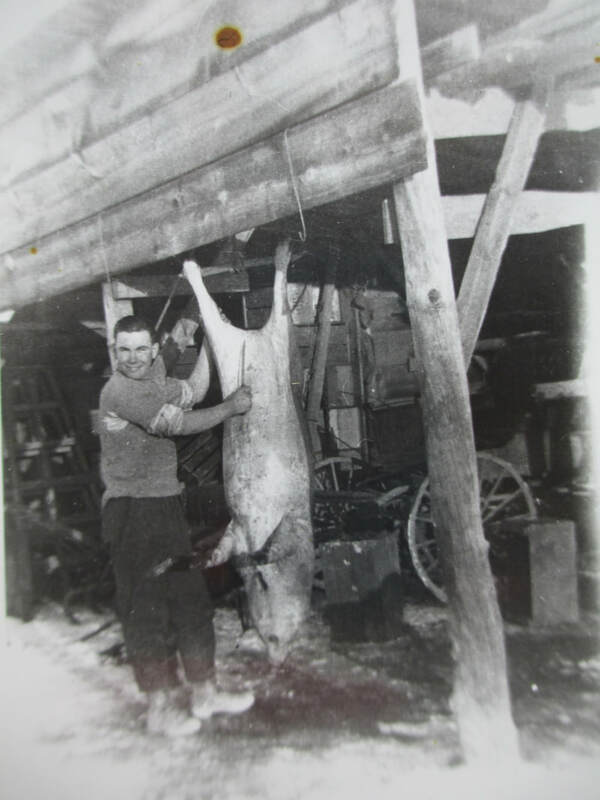 On summer days when everything was caught up, they would prepare for winter returning 7 miles to the Glenmore homestead to cut fir and pine trees for winter firewood. 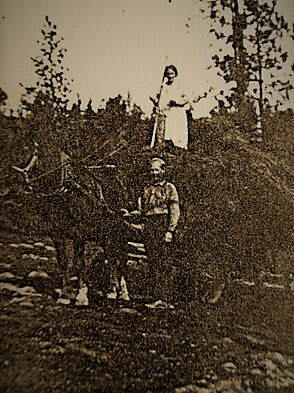 When the horse drawn wagon was full they would return home to stack the firewood. One load was a full day operation. Even though the family worked very hard together, and each member was responsible for their specific chores, they also enjoyed time together. In their spare time they could be found playing kick-the-can, or hide and seek - they were no electronic nintendos or other games ! Sometimes they would hide on their two dogs Pal & Fido however they were always found pretty quick ! 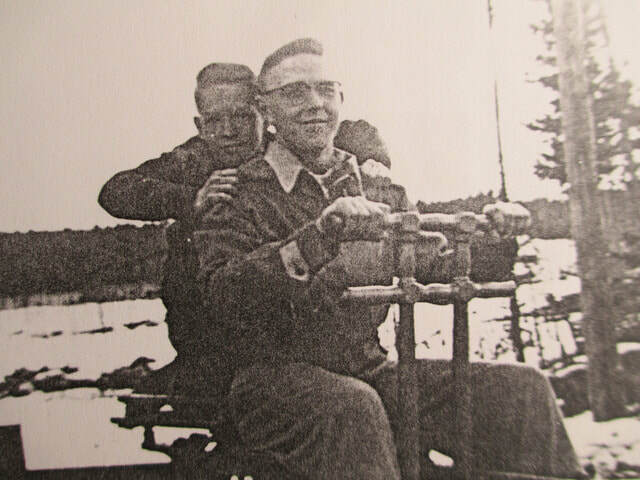 Richard & Don riding, or posing for the camera, on a hand trolley in the McCullough Valley on the Kettle Valley Line. 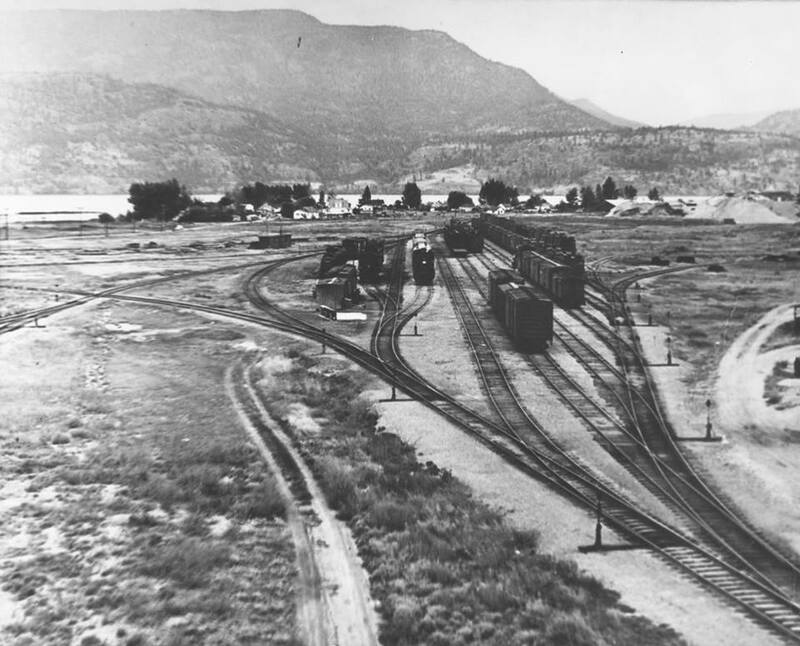 In 1945 Percy took Richard on the McCullough train for an adventure on the Kettle Valley Railway to Vancouver. They stopped for coffee and breakfast at a White Spot restaurant. Then they took the ferry to Victoria at midnight. They recalled the ferry's motion in rough waters and a full moon. Marguerite and Richard attended school until grade seven and then went to work. Marguerite worked as a housekeeper for the families former neighbours Mrs Kerr and Miss Lawrence. 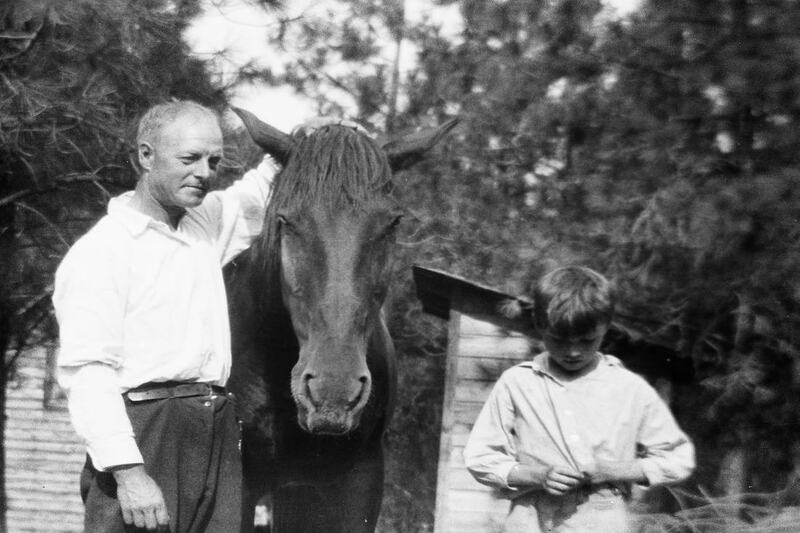 In 1948, Richard quit school to help his Dad on the family farm. In the fall, he took a relief job delivering, first with his bike and then with the company van, for the Hall & Hankey Bakery at 430 Bernard Ave, enabling his friend to have holidays. His wages there were $5 / day. This job worked into a permanent position and he worked at the bakery until 1950. Hall & Hankey's Bakery also employed Marguerite, and Arthur who made mini-donuts. Marguerite went from the bakery to working at JF Fumerton's clothing department. She spent several summers helping at the Otter Lake Bible Camp in Ontario which was operated by the Gordon Hayhoe family. Arthur and Don both finished their high school but chose not to pursue higher education. Don started working at the SunRype Apple Juice Plant, and then made his career with the Canadian Navy. After graduation Art worked at CPR telegraph delivering telegrams. He then was bookkeeping in the office until he transferred to Vancouver C.P.T. office. 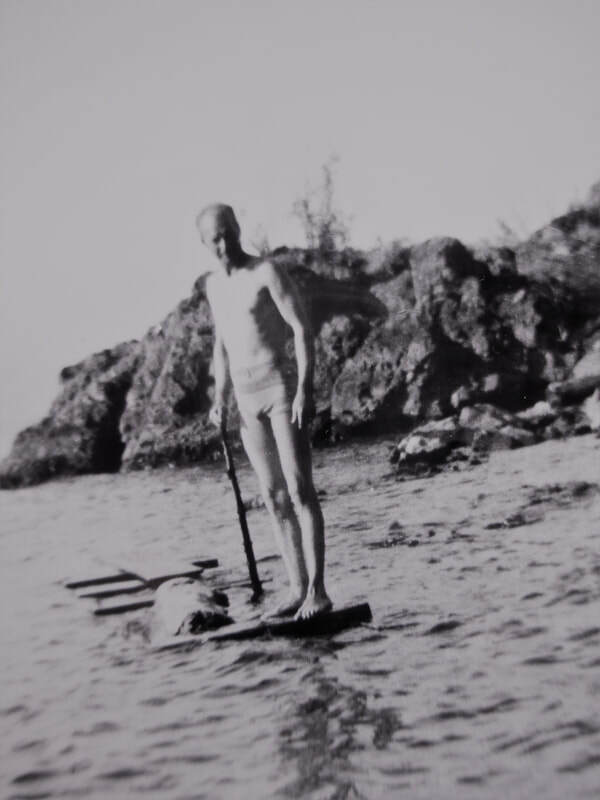 Percy was a strong swimmer and regularly swam across Okanagan Lake. He had strong wit, and a good sense of humour. He was an avid player of board games especially chess, checkers, and dominoes. As a youngster, earlier on as I was learning, he would forfeit the game to enable me to win. However as time drew on matches became very competitive and enjoyable. He enjoyed his quiet time for reading & reflection and could be often found off in a secluded location humming or singing. I remember very fondly looking forward to large gatherings for Sunday dinners cooked with love over a wood fired stove. 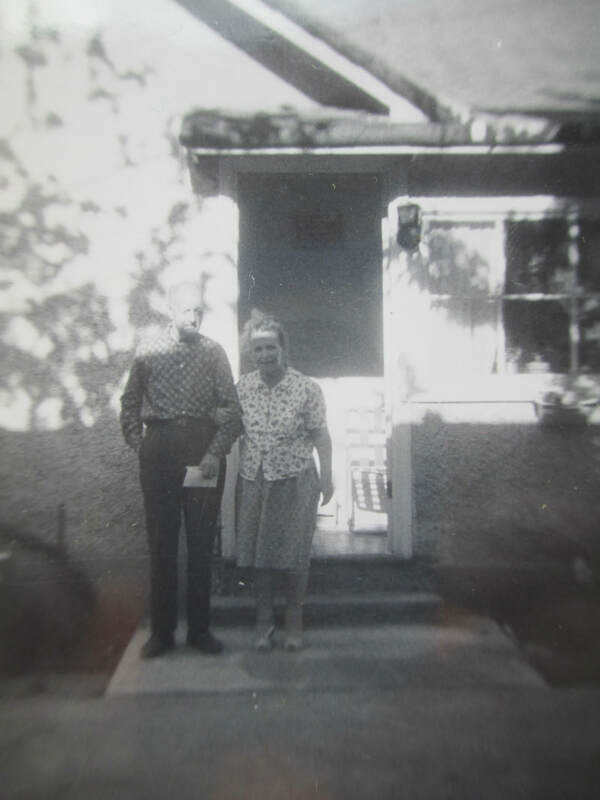 In the mid 1960's after Percy’s second heart attack, they sold the farm and bought a house on 806 Burn Ave. in Kelowna. 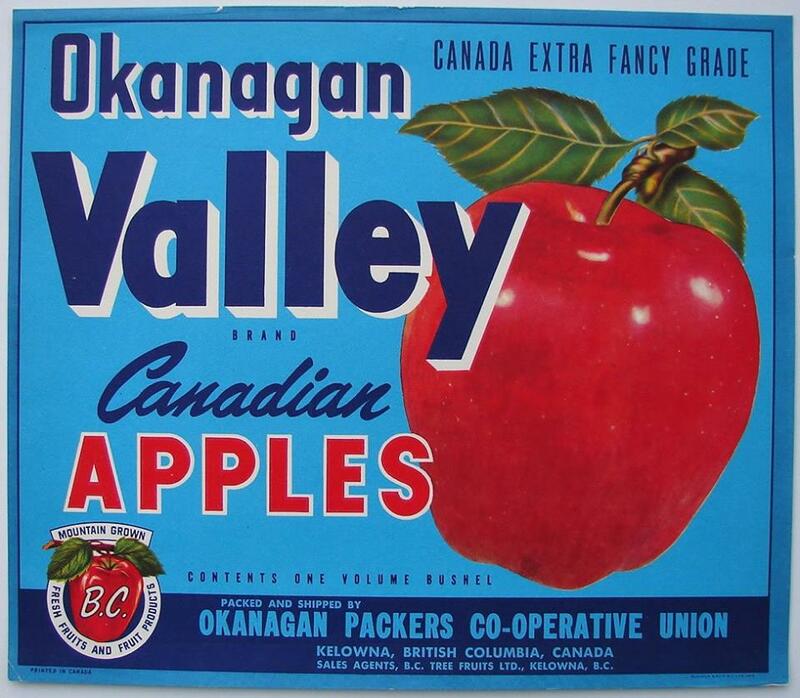 In hindsight 1961 was the peak for the orchard industry in the Okanagan Valley with 32,600 acres in production. Increasing populations demanded agricultural lands be sacrificed for urban development. Agricultural land use restrictions and control were implemented in the early 70' s to slow the loss of prime agricultural lands. His 32 years experience with orchards coincided with the industry's inception to its peak. The Burne Ave home is the only home of my grandparents that I knew, and of which I have many fond childhood memories. I spent time here from the countless regular Sunday dinners, special occasion visits, playing with cousins from out of town, to living here with my parents for a spell while they built a new house. Inside memories of porches on both the front and back doors. Sprawling bedrooms in which a youngster could easily get lost. There were very steep stairs that descended from a trap door in the pantry floor into a cold storage root cellar. I remember tumbling down these once to the adults chagrin. The cast iron wood stove providing heat for the home and wonderful smells of roasting meats, baking, and canning fruit preserves. There was an old pump organ which although a lot of work provided rich melodies during the evenings. There was a beautiful ornately carved wooden rocking chair from which many stories were read, clothes patiently knitted or crocheted, songs sung, and peaceful naps were enjoyed, especially after a large meal. My grandfather taught me how to play snakes and ladders, dominos, racko, and chinese and regular checkers. While I was learning he would occasionally throw the game and allow me to win to build my confidence. Life was still relatively simple growing up in those days, and this warm loving environment filled with laughter, hugs, and tears helped create solid character. In my golden years I have returned to this " simple " yet peaceful and rewarding life style instilled in me, living in the developing country of Ecuador. Outside memories included playing " hide and seek " in their old garage, picking cherries and climbing the old cherry trees. A small creek ran behind the property providing cool relief on a hot summer's day, enabled tubing all the way to Okanagan Lake, and provided a good fishing spot for a young lad. In the winter of 1969 in March the Okanagan Lake remained completely frozen over. 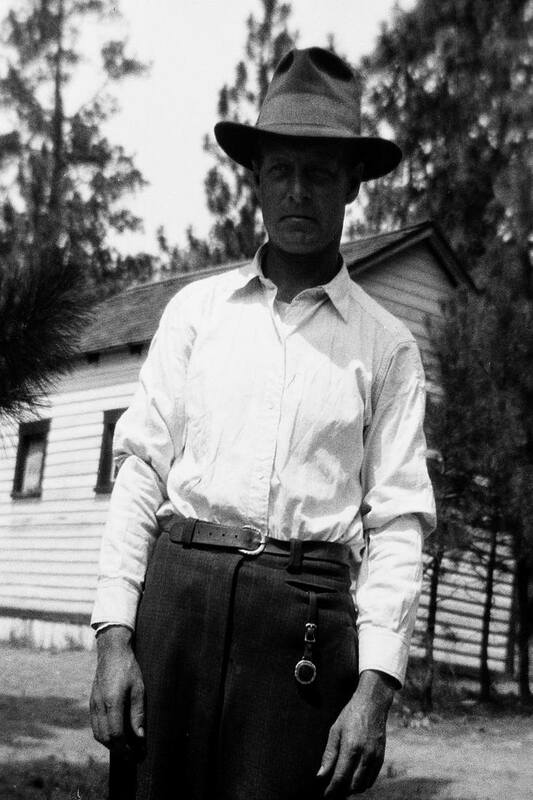 During Percy’s last 20 years, he silently suffered with swollen hands, and elbows due to arthritis. It did not impact his love of life, nor ability to play checkers, or with his growing number of grandchildren. He maintained a wonderful sense of humour, and often sought out a quiet and tranquil location to sing hymns or read. 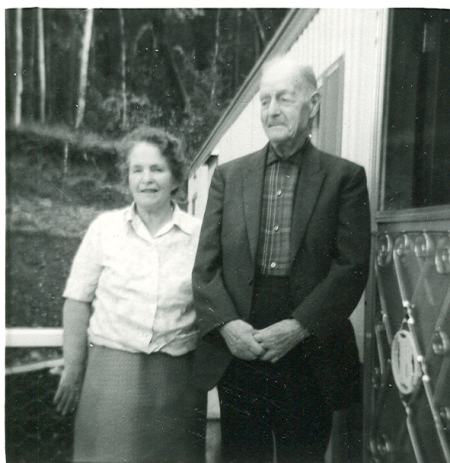 They lived there in harmony until Percy passed away from a heart attack on May 27 1971 at 84 years old. He was a true pioneer, strong in the face of adversity , fairly quiet and shy, very warm, compassionate, generous person who embraced life fully. He made the best of each day, being busy and happy, enjoying what he did, thoughtful and caring, patient and understanding. 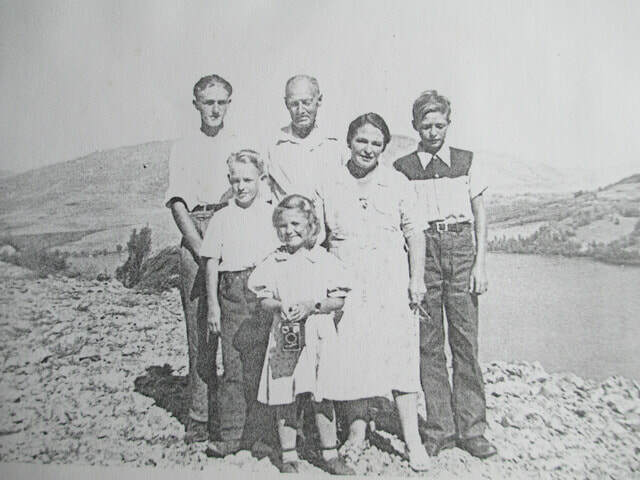 Family was important to him successfully raising five children in the early years of the sunny Okanagan. 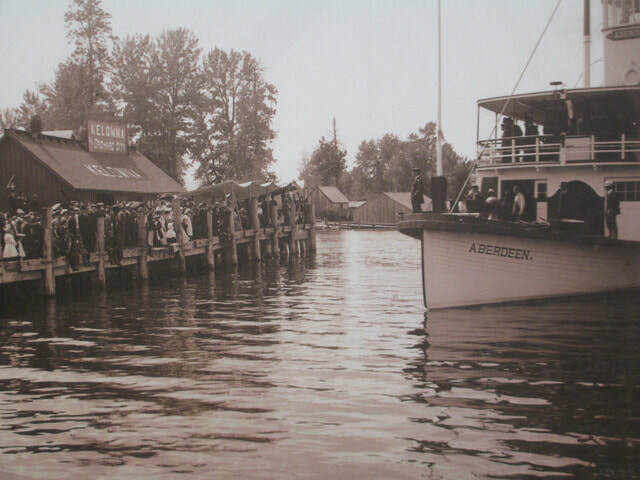 The Kelowna Regatta tracing its roots back to 1886 was a community fair focused on the water with sunshine, bathing suits, swimming, diving, and boating competitions, sports tournaments, lumberjack competitions, agricultural displays, and musical entertainment. Historically a main feature event was the wooden apple box races. 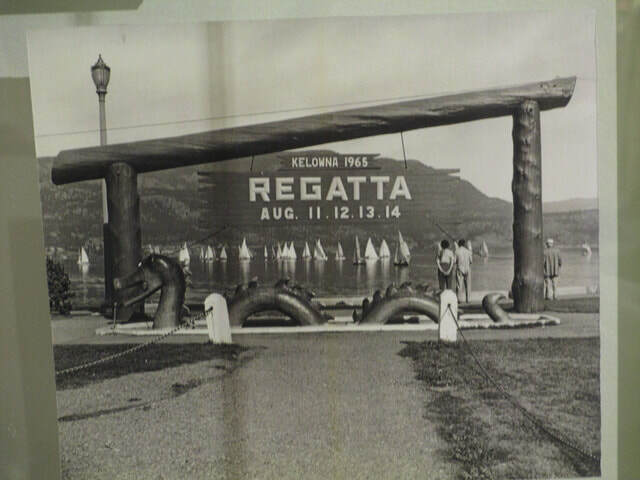 Its history reflects the development of Kelowna's recreation, as well as the community's failure to respond successfully to the Regatta's growth. 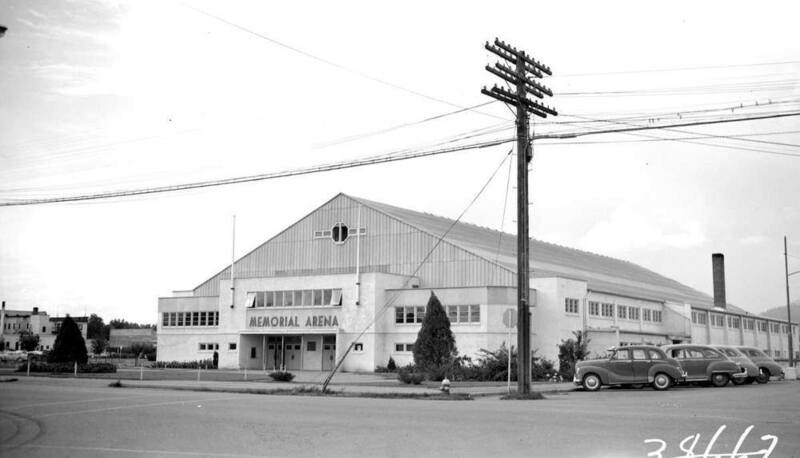 On July 13, 1969 a fire started by two youngsters smoking destroyed Ogopogo Stadium the headquarters for Regatta. Just several weeks later on a clear day in August the International Regatta was on. People were getting ready for the parade. Overhead, the U.S. Navy Blue Angels aerobatic team with Mach 2 jets, capable of speeds in excess of 1600 mph, performed a memorable air show with a graceful diamond vertical maneuver. And then a deafening crash, a sonic BOOM shattered $ 800,000 of windows in downtown Kelowna. Here is a short 47 second video clip from the CBC digital archives about the aftermath of this incident. 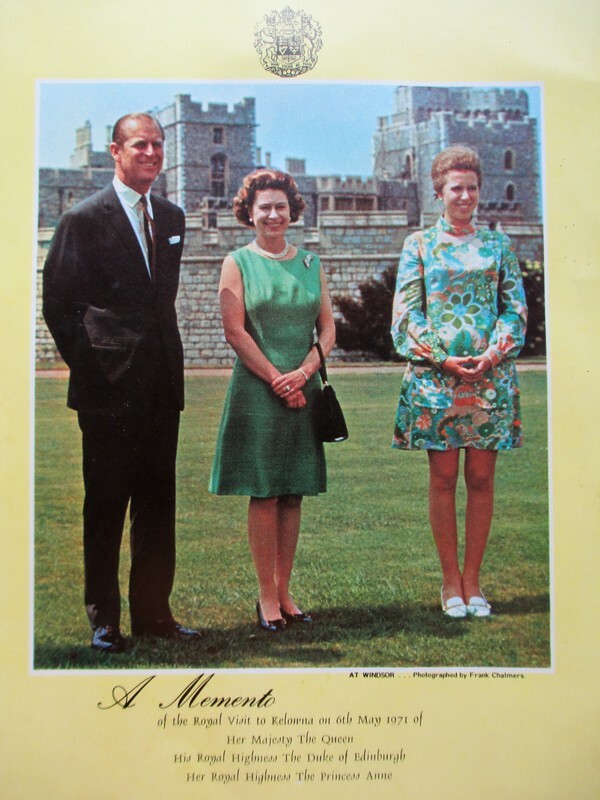 Queen Elizabeth graced Kelowna with a visit on May 6, 1971. In 1971, the same year Queen Elizabeth visited Kelowna, Docie sold the Burne Ave house and moved into a mobile home. Then on September 10, 1976 she moved back to Vancouver where she was born. She lived in Parkdale Manor retirement home. She continued to love camping, entertaining, playing board games especially Dominoes, Racko and Aggravation, and word search puzzles. In 1981 she undertook a cross Canada adventure with family to visit relatives and sightsee. She constantly was giving of her time and spent many hours knitting and sewing clothes, and washcloths for all her grandchildren and great grandchildren as well as making items for her cousin Sue’s craft sales. She also knitted toques for Union Gospel mission, and hats for newborn babies at the Peace Arch hospital. The long standing community festival of Regatta ended in 1986 with a violent riot. Teenagers had been cruising and drinking and at 1:00 a:m the streets were closed and they gathered at the Sails on Bernard Ave. The energy and violence of the mob escalated quickly from tossing beer bottles to breaking storefront windows, and looting. Police officers were called from Vernon, and Penticton, riot gear, tear gas, and water canons were used to disperse the mob. 105 arrests were made and over $ 250,000 in damages sustained. The riot and violence occurred again the following year in 1987 and effectively ended the 81 year community tradition which had become a “ summer party “ which the community could no longer control. July 1st to 4th , 1993 Vancouver, B.C. 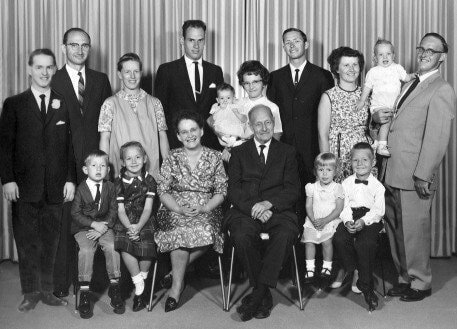 Front center - Theodosia Millard From the left: Dan Fehr holding Tyler, Wanetta Fehr with Kayler, Richard & Gladys Borton, Valerie Borton, Tim Millard, Paula Millard, Marguerite & Charles Ludvicek, Bob Millard, David Ludvicek, Sarah Ludvicek, Thomas & Jill Ludvicek holding Alex , Don Millard, Art Millard, Ernie Millard, children front row Lauralee Millard, Zack Troyer, Jason Millard, & Kirsten Millard. 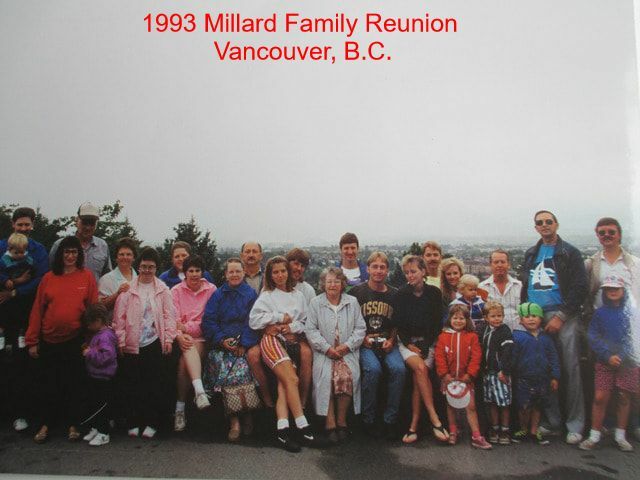 On the Canada Day long weekend in 1993 the Percy Richard Millard family gathered in Vancouver B.C. for a very well attended family reunion with a variety of activities. The above photo was taken in Queen Elizabeth Park, Vancouver. On May 9, 1997 Docie moved to Evergreen Baptist Home in White Rock, B.C. Even in her later years, and final days she was ready to tell others about her Lord. Just the other day a nurse came in and she was saying something to her. We lifted her mask and she said, “Believe on the Lord Jesus Christ and you shall be saved.” The nurse smiled and left. A few minutes later another nurse came in and said “Well how’s deacon Millard today?” One of her last statements was “I love the Lord, the Lord loves me and he is very good to me.” In all her years the Lord came first, her family second. Only a few years shy of living an entire century she passed away in Richmond General Hospital on January 4, 2005 at the age of 97. She was a very warm, compassionate, generous person who embraced life fully and was blessed with health and longevity for 98 years. She made the best of each day, being busy and happy, enjoying what she did, thoughtful and caring, patient and understanding. 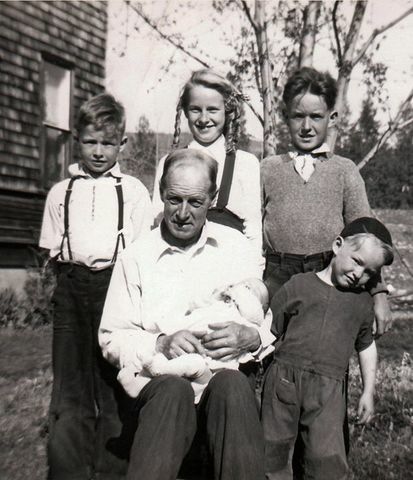 Family was important to her raising five children on a homestead in the sunny Okanagan. Everything is farther away than it used to be, It is even twice as far to the corner and they have added a h i l l .
It seems to me they are making the stairs steeper than in the old days. And have you noticed the smaller print they use in the newspapers? There is no sense n asking anyone to read aloud any more, as everybody speaks in such a low voice I can hardly hear them. The material in dresses is so skimpy now, especially around the hips and waist, that it is almost impossible to reach one's shoelaces. And the sizes don't run the way they used to. The 12's and 14's are so much smaller. Even people are changing. They are so much younger than they used to be when I was their age. On the other hand, people my own age are so much older than I am. I ran into an old classmate the other day and she has aged so much that she didn't recognize me. I got to thinking about the poor dear while I was combing my hair this morning and in so doing I glanced at my own reflection. Really now, they don't even make good mirrors like they used to. 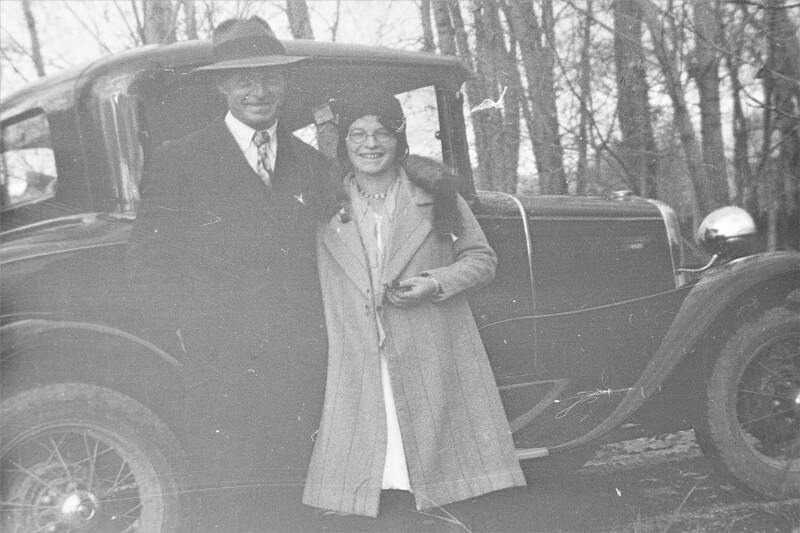 Percy & Docie had 5 children, 14 grandchildren and 26 great grandchildren whose stories follow, and are still being written.